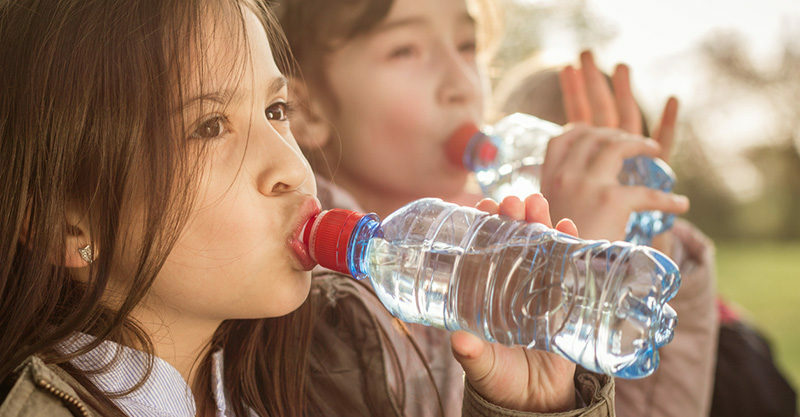 An integral element in any child’s back to school arsenal, a sturdy drink bottle is a must. Learning is thirsty work after all! 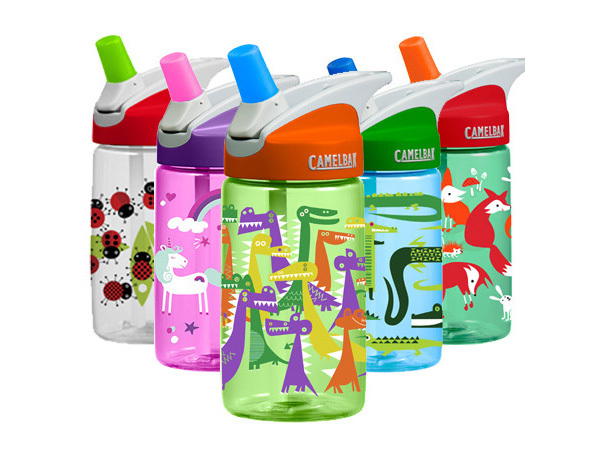 A wonderful size for young children, the Camelbak Eddy Kids’ Water Bottle is easy for small hands to operate – just flip, bite and sip. Available in a range of awesome colours and prints, there’s sure to be one which will appeal to your little one. Available from Hello Green, priced $22.95. One of my own favourites is the ever handy Eco Bottle range from Tupperware. Its one litre capacity means kids typically get through the school day without having to refill. Tupperware also offer spare parts and a lifetime guarantee – that’s hard to top! 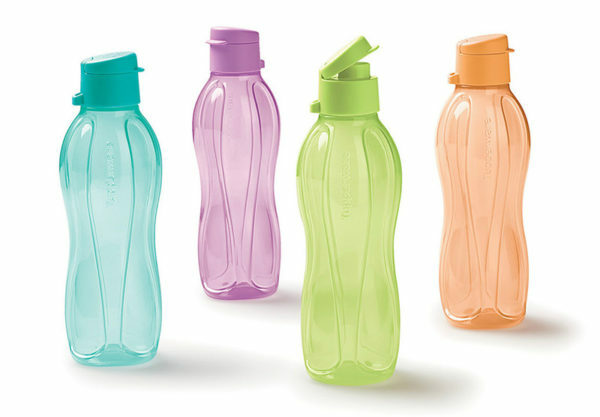 Priced $59 for a set of four drink bottles, head to Tupperware to find your local consultant. 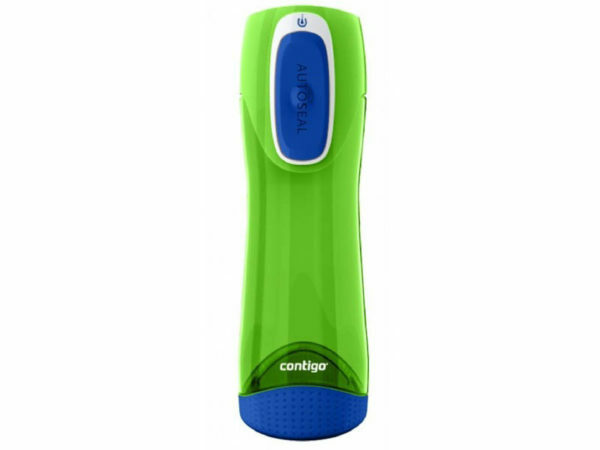 King of all things travel, Contigo make a very groovy water bottle. Simply press the button to sip. An auto seal lid ensures there will be no leaks and no messy spills in a school bag to deal with! Find it at Biome, priced $18.95. 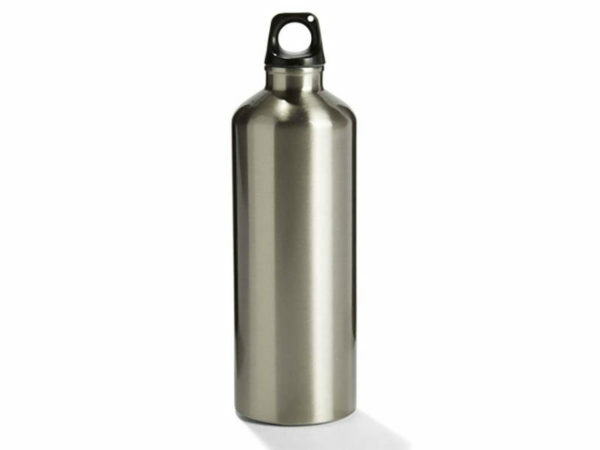 The stainless steel SIGG water bottle range includes sizes to suit all sized drinkers, from the smallest to the biggest. 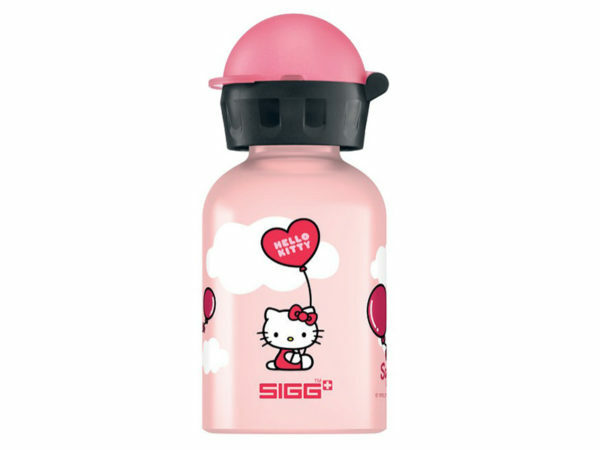 If there were awards for cute drink bottles, this sweet Hello Kitty 0.3 litre SIGG bottle would win hands down. Ticking the boxes of tough, leakproof and replaceable parts, you can order it for $33.60, direct from Bio Swiss. All awesome things contain sprinkles, yes? 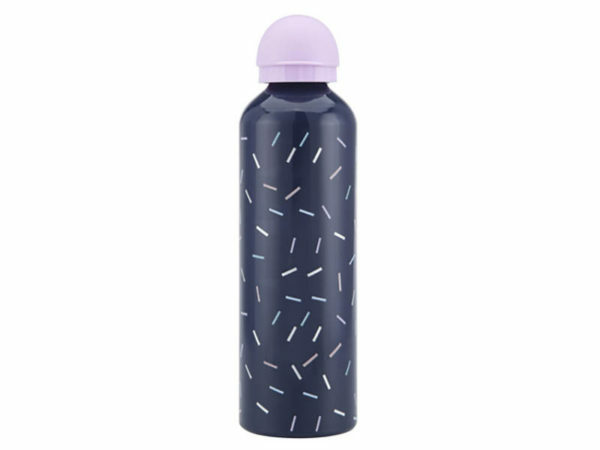 Nab yourself this 750ml sprinkle print covered aluminium bottle from Kmart. Be quick, it’s only $5! 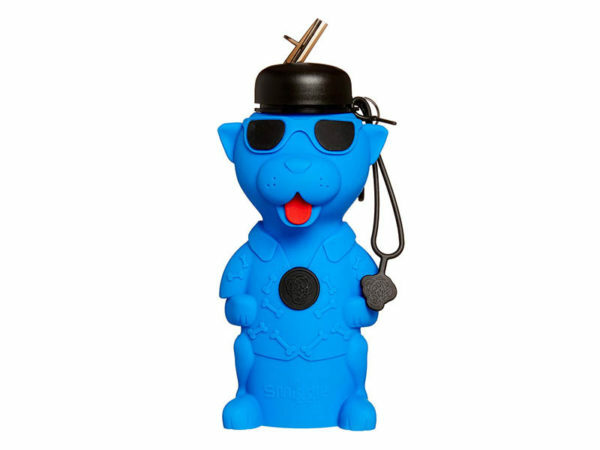 The most elaborate water bottle I’ve seen in a while, it also looks like crazy fun! The Meow Woof Silicone Water Bottle has a flip spout for easy drinking, plus it rolls up when it’s empty, saving space in the school bag. There’s one for cat lovers and those devoted to dogs, $24.95 from Smiggle. 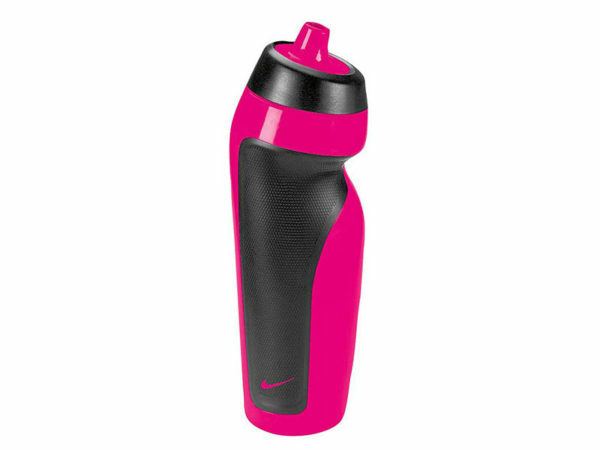 I can vouch for this one – the Nike Sport Water Bottle is nothing short of fantastic. With a 600ml capacity, it is not only leakproof, there’s no lid to lose, and it’s dental friendly – just tip and drink! $16.99 from Rebel Sport. You can’t go wrong with anything bearing the Thermos name and Foogo is no exception. 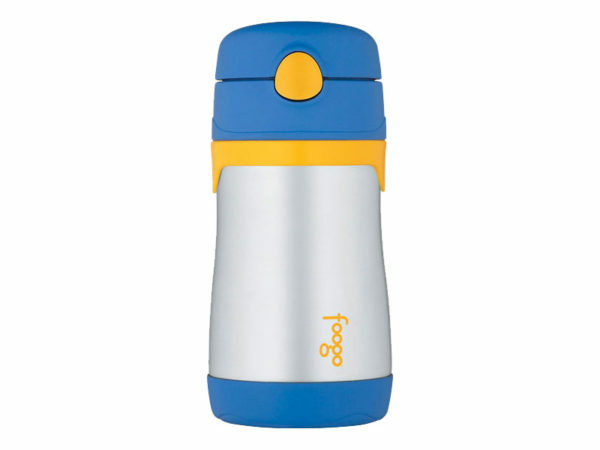 Keeping contents cold for up to 10 hours, the Thermos Foogo Phases Stainless Steel Kids Straw Bottle is just the ticket for quenching thirst on hot days. Find it at Haggus and Stookles, priced $34.95. The Kmart Stainless Steel bottle fits the bill as the ultimate stainless steel drink bottle for the kid who just wants a cold drink – and lots of it. $6 from Kmart. 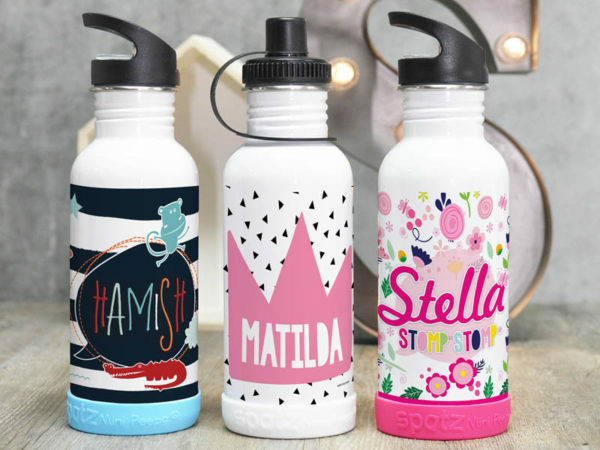 A wise investment, a personalised water bottle is pretty tricky to lose for any length of time in the playground. A non-slip base protector stops the bottom of the bottle from becoming scratched, keeping its good looks for longer. A bounty of colourful designs await you! It’s just $24.95 from Spatz.